The September 4, 1925 Nashville Herald reported the tragic death of Merle Elizabeth Langford. Little Muriel Langford, the 5-year-old daughter of Mr. and Mrs. Luther Langford, who resides about a mile from Ray City on the Milltown-Ray City road died Tuesday morning from what was thought to be the bite of a rattle snake. The child was playing in a potato patch, near the house, while her mother was working nearby, when she cried out and ran to her mother. The mother thinking the child had fallen down and hurt herself took her into her arms to console it when she noticed that blood was oozing from her leg just above the ankle. Thinking that possibly the child had been bitten by a snake or some reptile the mother started for the house but before reaching the house the child had become limp. The father, who was at the home of a brother nearby was notified and an effort to secure a physician in Ray City failing, Dr. Smith of Milltown was summoned and arrived within a short time after the child was bitten. Dr. Sloan of Stockton was passing and was also called in and both these physicians rendered all the aid that medical skill could give, but the child died within half an hour after their arrival. The funeral services were held at Beaver Dam church and the internment took place in the church grave yard Wednesday, Rev A. W. Smith of Ray City and Hahira conducting the rites. 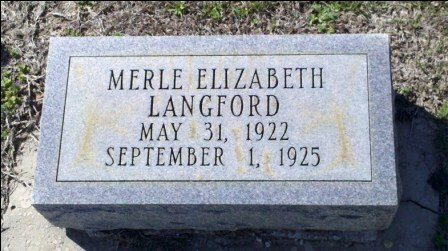 Merle Elizabeth Langford, Beaver Dam Cemetery, Ray City, Berrien County, GA. The New Georgia Encyclopedia goes on to discuss the Wiregrass ecosystem as a source for Georgia folklore and the rattlesnake motif in storytelling. Rattlesnakes constitute another popular motif. A rationale for ritually burning the forest, unchecked rattlesnake populations represent a real threat to people. Personal experience narratives, as the prime prose narrative form of our times, frequently function as cautionary tales, warning about this potential threat. Several wiregrass Georgia towns (Claxton, Whigham) annually host rattlesnake roundups. These festivals shift public attention to the prevalence of this dangerous species, especially since local laws prohibit burning the woods without a special permit. Instead, communities sponsor roundups in which competitors literally capture hundreds of snakes. Every year, for example, as many as 20,000 people attend the parade and festival in Whigham (population 605). Claxton promotes its roundup as “the beauty with the beasts” competition: the judging of the snake competition occurs at the same time as the crowning of the Roundup Queen. According to the Centers for Disease Control and Prevention in Atlanta, GA only a handful of snakebite fatalities occur annually in the U.S. today. Venomous snakes found in the United States include rattlesnakes, copperheads, cottonmouths/water moccasins, and coral snakes…. It has been estimated that 7,000–8,000 people per year receive venomous bites in the United States, and about 5 of those people die. The number of deaths would be much higher if people did not seek medical care….There are many species of rattlesnakes in the United States. Rattlesnakes are the largest of the venomous snakes in the United States. They can accurately strike at up to one-third their body length. Rattlesnakes use their rattles or tails as a warning when they feel threatened. Rattlesnakes may be found sunning themselves near logs, boulders, or open areas. These snakes may be found in most work habitats including the mountains, prairies, deserts, and beaches.